.FUEL is an arcade, shoot-em-up esque kinda a game, with similarities to games like Asteroid. 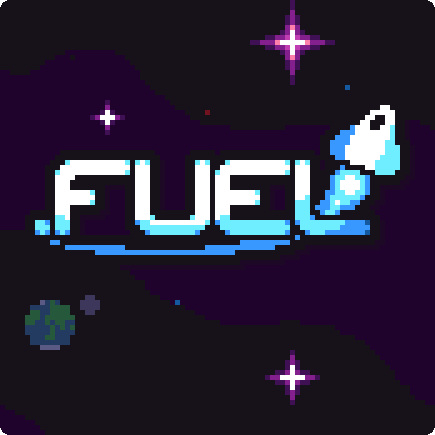 In .FUEL, you take control of a small spaceship on its mission to defend earth from Alien Drones, while trying to not die yourself, from losing too much fuel. How do I get more fuel? While the game is running you are constantly losing fuel. If the tank hits 0, that's it for you. So how can you refill your tank? By defeating enemies! When defeating an enemy, they'll drop some fuel that you can collect. The higher your current combo, the more fuel they will spit out. But wait, Combos? By making defeated enemies fall into other enemies, you can increase your combo multiplier. The higher the multiplier, the more points you get and the more fuel you get. You might even get some crate deliveries sent your way. When you reach a combo multiplier of 5, an item create will appear. By collecting those, you'll get a random powerup. It could be a laser, a triple shot or even homing shots! But be fast. As soon as they leave the screen, there is no way to get them back! Can't wait for that! I'm sure you'll be a shining star and won't disappoint. :) Looking forward to your new game(s)!